These days, “African food” is no longer considered an automatic oxymoron in the dining world. Ethiopian restaurants have gone mainsteam ethnic in many American cities, and are especially prevalent in Washington, DC. Merkato 55, Marcus Samuelsson’s attempt at “Africa meets Meatpacking,” opened to much fanfare in New York City in the spring of 2008. (Merkato 55 has since been re-packaged as the pan- Mediterranean restaurant Le 55). Despite its recent exposure, sub-Saharan African cuisine remains a bit of a mystery in the international food scene compared to other ethnic foods. 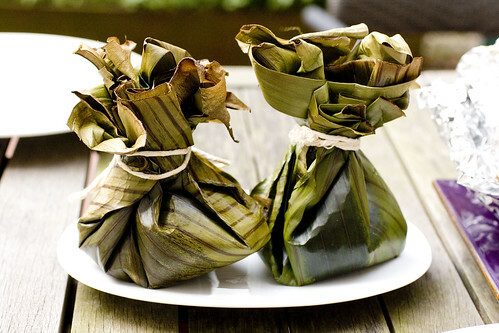 Unlike Asian food, for example, African foods’ regional differences and local nuances are not common knowledge. Jess and Lon suggested I give a few more details about what I eat on my next trip to the continent. In a lucky twist of events, I recently took an unexpected trip to re-visit the Democratic Republic of Congo (DRC). Once again, I put on a few pounds. The DRC is roughly the size of Western Europe and borders nine countries, including ones in central, eastern and southern Africa. 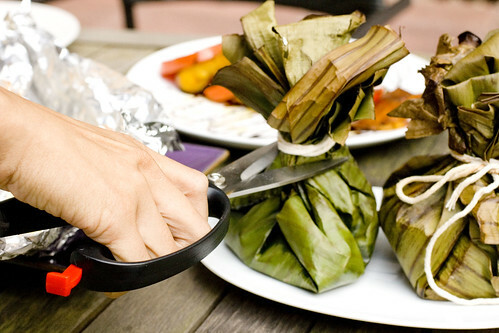 Reflecting the country’s many landscapes and regional influences, Congolese cuisine is quite diverse. 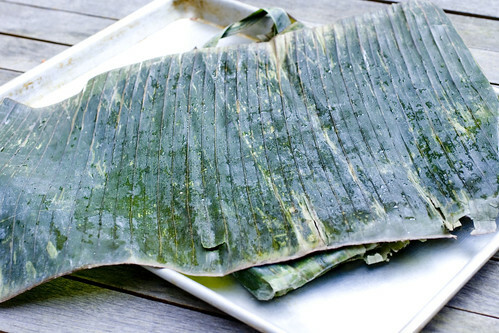 Here is one of my favorite dishes from Western Congolese cuisine. It’s lighter than most other typical fare in the region. The Congo River is the second longest in Africa, after the Nile. Read: Delicious and abundant fish. The best river fish I’ve had while in the DRC comes from Bandunduville, a small sleepy provincial capital. There I once found an informal backyard restaurant, run by the daughter of a famous Congolese singer, which served a miso flavored fish plate. Go figure. 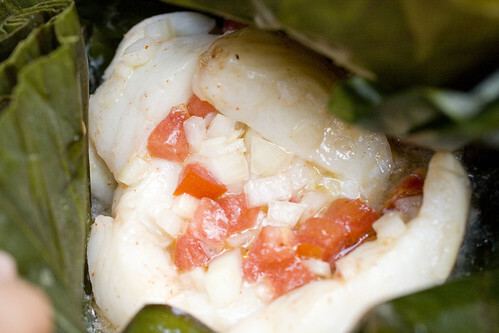 Liboke is a traditional preparation of fish (or meat) popular around the Congo River basin. Around lunchtime in Kinshasa, the overcrowded capital of the DRC, entrepreneurial ladies can often be seen walking along the streets with a basket or basin full of these banana leaf bundles balanced atop their heads. It’s usually accompanied by a cassava based starch, such as fufu or chikwangue. 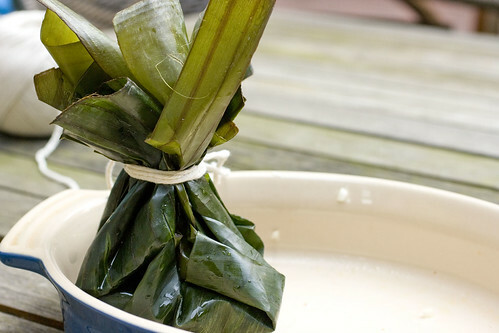 With a few guidelines from congocookbook.com (where you can find other Congolese recipes) and Zoe’s experiences, we came up with a recipe that you can easily try here. 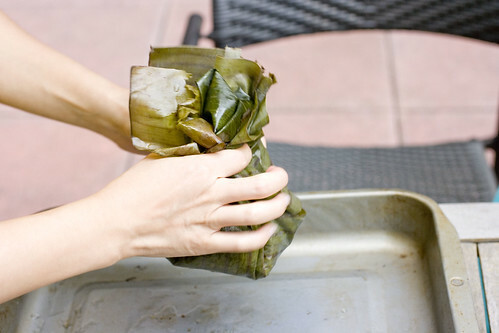 You can find frozen banana leaves at Spanish grocers. (We had a pack from Goya, also available online.) You can also try using any type of fish you like. 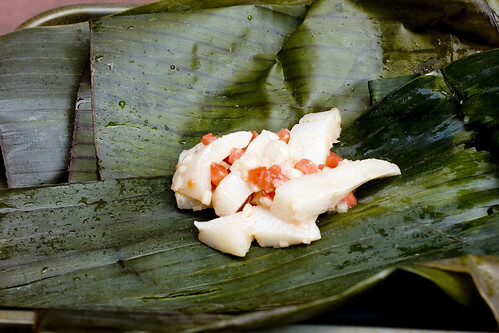 Freshwater fish would be most authentic, but I couldn’t find any that day so we used flounder and it seems that a delicate fish works well in this light preparation that reminds me of en papillote, a French technique of cooking in parchment paper. Here the banana leaves offer a lovely scent though. 2. 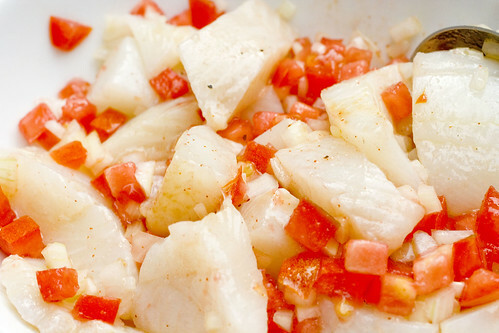 In a medium sized bowl, stir together onion, tomato, lemon juice, olive oil, cayenne, salt and pepper. 3. 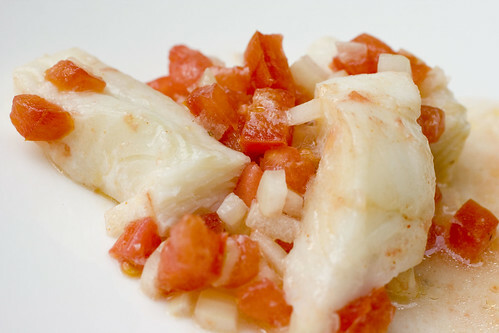 Cut fish into pieces (about 1″ x 3″). Toss with onion/tomato mixture. Set aside for 15 minutes. 4. 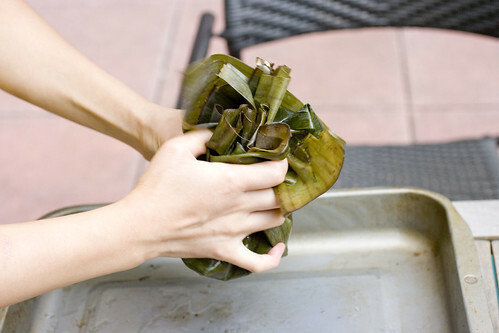 If banana leaves are stiff, run hot water over them to soften. You want to lay out a piece large enough to bundle up as shown in the picture. 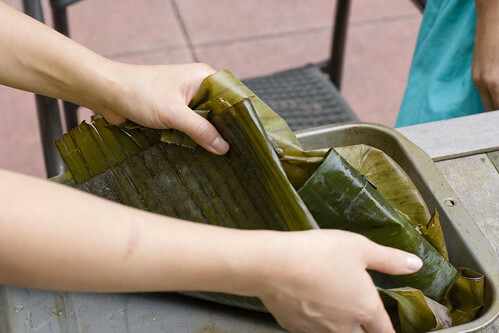 There should be 3 layers of banana leaves. 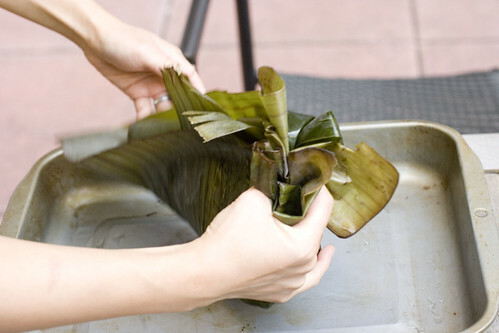 Divide the fish into 3 separate bundles and tie them up. 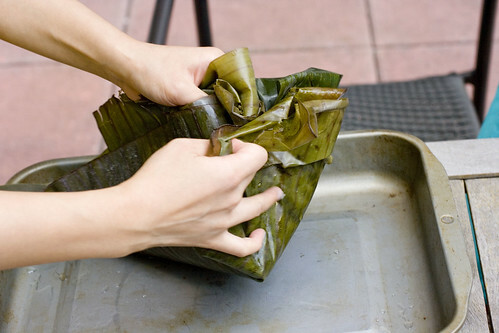 Place them in an oven-safe dish. Bake for about 25 minutes, or until fish is cooked through. 5. Serve by cutting the bundle right below the string. Serve immediately. Each bundle is an individual portion. Pull back the leaves for a tropical scented fish stew with very tender fish and just a little broth. It’s light and elegant. posted by jessica	at 09:09 AM	Filed under African, Recipes. You can follow any responses to this entry through the RSS 2.0 feed. Both comments and pings are currently closed. what a nice guest post from Zoe, and what cool recipes! thanks for introducing such ethnic cuisine. haha – “These days, ‘African food’ is no longer considered an automatic oxymoron in the dining world. Ethiopian restaurants have gone mainsteam ethnic in many American cities, and are especially prevalent in Washington, DC.” so true… really funny description of the parental guilt-tactic, zoe! ‘miss hangin’ out with both of you! excellent photos, jessica! Congrats on all your new hungry readers! Oooohh–I love the presentation. Very simple and elegant, and I love the burst of color awaiting the diner. Thanks Zoe! Hi Stephanie, looking forward to seeing you in October. hey jessy!! those pretty gifts sound terrific! so pretty and sound delish! yumm!